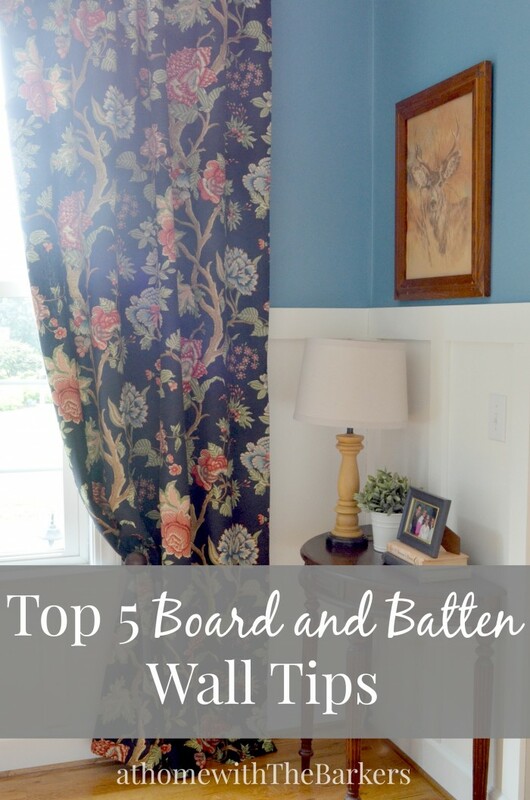 Check out my top 5 board and batten wall tips for a great way to add detail to any room. Wall details is one of the hottest trends in decor. Whether you choose an entire room or a feature wall, you can’t go wrong with board and batten. Before I get to the details of our recent dining room makeover you must know the real story of how this came to be! I told my husband earlier in the summer I wanted to makeover the dining room and that I wanted to do this to the walls. He didn’t quite understand what I meant…he doesn’t look at Pinterest, magazines or blogs (except this one of course), crazy I know! I tried explaining my vision. His response was, he saw no reason to make over a room that we barely ever use! What?! Sure there is I thought. Nonetheless, I let the dream go and said I understand where he is coming from. Fast forward to me coming home from Haven Conference in July to the BEST surprise ever! He not only designed the wall layout, he had bought all of the supplies, removed all 0f the old trim, cut all of the MDF boards and started the process of hanging it all! It was exactly what I saw in my head. OH, and he took a few pictures!! There are many tutorials on how to do this so I just wanted to share with you my top 5 board and batten wall tips that make the install easier. Also, for authentic board and batten, you would actually add boards to the entire wall then add the battens. For our DIY project we chose to use our wall as the board part. Therefore, you could call the faux board and batten tips. The less damage to the wall, the less repair work, the less sanding you have to do. WIN, WIN! 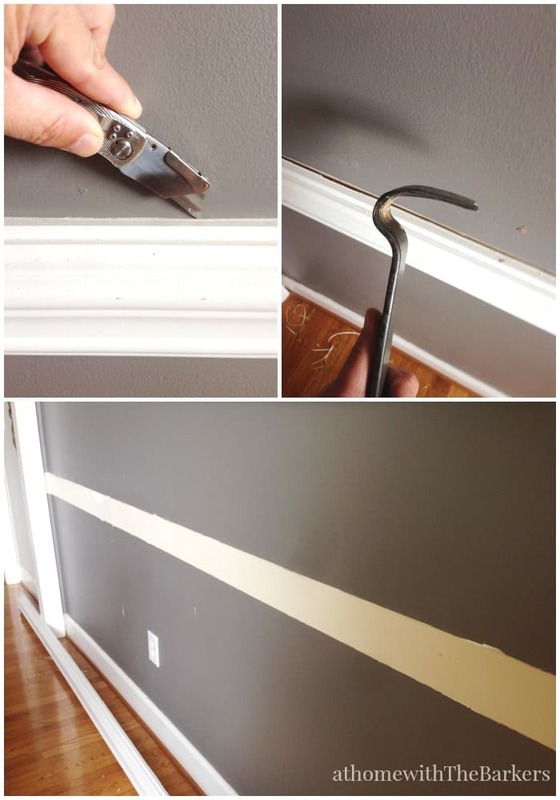 Using a blade you cut the caulk away from the old trim and the wall. Then use a pry bar to pop the trim nails. Go slow. 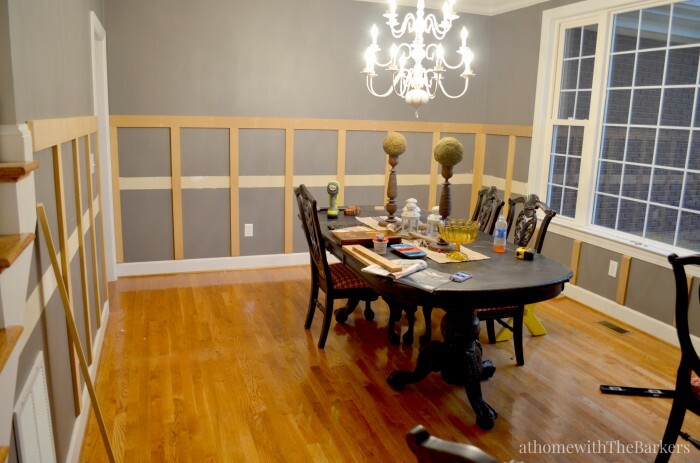 We used MDF for this project because we wanted a smooth transition from our existing trim. Before you paint MDF with latex paint you have to paint it with oil based primer and let me tell you, it smells…BAD! Here is where I appeared on scene, just in time to use the new finish nailer he picked up for this job. That tool is the best time saver EVER! I know I talk about Ryobi often and they have been very good to me as a blogger but this is not a sponsored post. We bought this one ourselves because we LOVE the products! **disclaimer…I was not wearing safety googles in the photo. In my excitement to test out the new tool I forgot to put them on. Otherwise, always be safe and wear your goggles. The wall height of the board and batten is pretty important but not exact. This is the best part of the “how my husband read my mind!” I had 60 inches in my head…he hung it at 58! I knew this would be substantial and visually pleasing yet still allow me to hang things on the wall. He knew that height would allow him to not have to cut extra boards to increase the height and were the perfect height as they were. In order to keep our existing trim work and keep our house consistent, we (he) had to add detail where the existing trim on the stairs and base boards would meet the new MDF battens. He did an amazing job. He did this by cutting one end of the board on an angle. Using a spacer keeps everything even. Cut an extra piece of board the distance between all of the battens before you start nailing. This will make things go much faster. I get lots of emails asking me about nailing the boards into the studs. While the boards nearest the corners and door frames do land on the studs we didn’t do ours specifically to land on the stud. We did ours in a way that would be roughly stud width apart BUT decided to make them even distance on the wall. We didn’t want our boards to look unevenly spaced so we measured our wall and then divided it up. Our spacer board ended up being 17 and a half inches. You will need to take your wall length and divide it up to get your specific distance. ALSO, we did not glue the boards before we nailed them. They are light weight enough and basically decorative, so they hold up fine. Notice how each corner has a piece of wood on the ends. This adds depth to the corners as well as allows us to keep each wall spaced evenly. 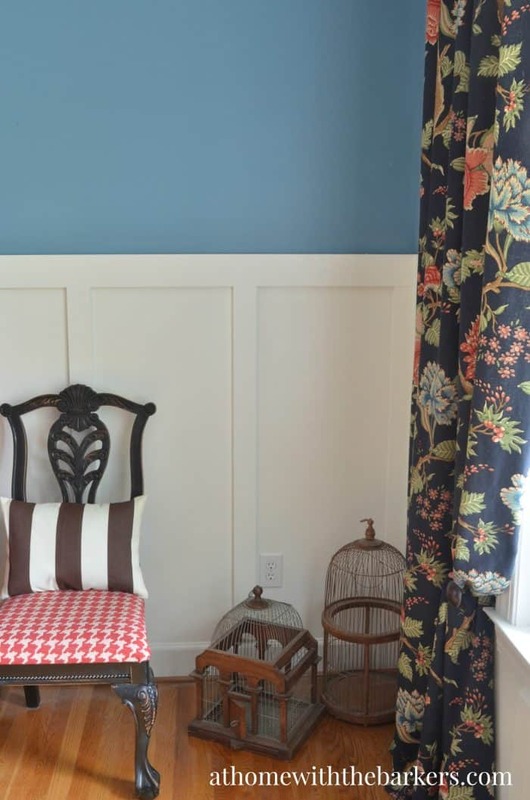 When you are creating your batten widths take your most obvious wall as your measurement. This will be the wall that is first seen when you wall into the room. Since this dining room has two entrances we went with the foyer view. That was also the only solid wall. The other walls had a window and stairs to work around. The less work you have to do the more time you have for the fun stuff like decorating. So, we decided that the existing wall would act as the “board” part of the board and batten. No need to spend money there, just paint the wall the trim color and you are done! 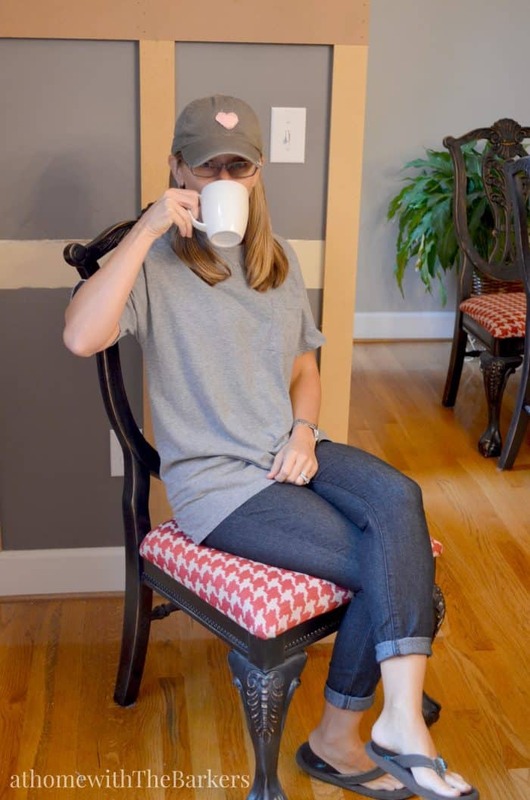 My sister thought the less is more was meant for her…less work, more coffee drinking. The dining room is now my favorite room and my inspiration for future room makeovers. See the full dining room makeover here! Perfect timing as I will be doing this in my daughters’ bathroom next month. Thanks! Great! But be careful with MDF in bathrooms, moisture is not a friend. Ask at the home improvement store if the oil based primer will be enough to seal the MDF from the steam. They may suggest wood. Looks beautiful Sonya! We did this in our foyer and up the stairs. It’s such a great way to get a custom look. Please always wear safety glasses around a brad nailer (that goes for the person operating the nailer and others working in the area). Safety first & foremost! You are absolutely right Carrie! I had just walked in from my trip and had to try the new tool…should have taken my hubby’s glasses. Next time for sure! So awesome and a great thing to do with a friend! Thanks so much for sharing. Great post! Did you purchase your MDF at the correct width or did you rip strips off of larger sheets? Thank you for ALL the wonderful ideas. Been in our house 18 years and I’m ready for some (lots!!) of updating!!! 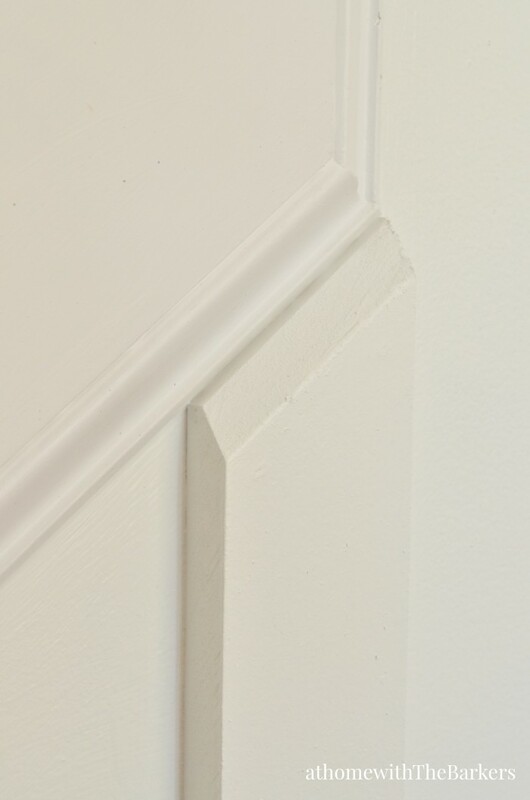 What details did you do when using your original trim? That’s exactly what I was going to ask- what are the dimensions of your batten angle cuts? How long are they? Amazing work! I’d love to do something like this… I’m just not certain yet that I’m handy enough to pull it off. Hi, did you nail the MDF into studs? 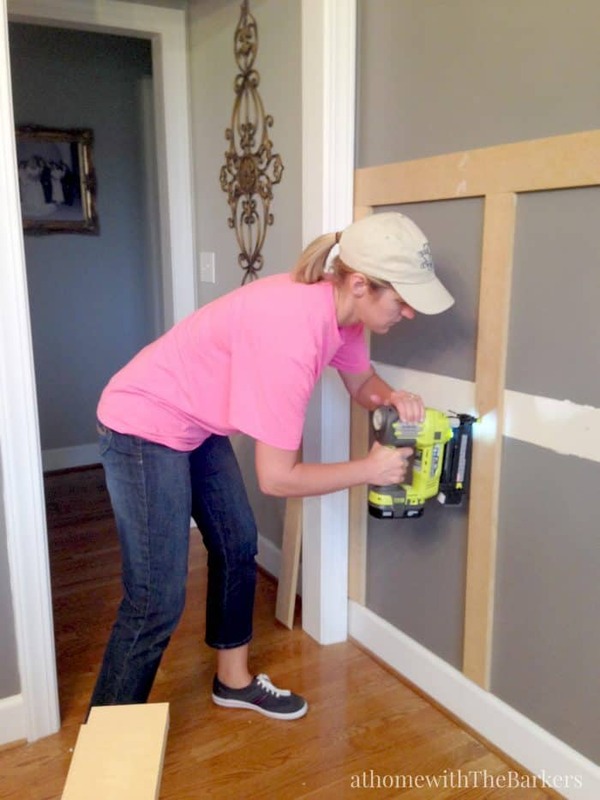 I did this in my previous home and my husband made a big deal out of having to hit the studs, which limited the distance of each board. Meaning I had to adjust the distance between the boards I wanted and compromise on them being exactly the same distance apart. If you didn’t hit stud, what did you do? No, we didn’t try to hit the stud. It’s not structural so no need. Did you paint the wall with the same type finish as the trim. In other words are the walls a semi-gloss too? Do you mean the white part of the wall between the pine boards? If so, yes. If you mean the colored walls at the top, no. I always use eggshell or satin there. Can you tell me the width of the vertical boards? Sure, they are 3 inches. We just bought some sample boards tonight. Yours looks great, and we are doing the same–painting the wall between the boards. However, my husband said we should use semi-gloss on the boards and the satin on the actual wall. Did you say that you did semi-gloss on both? Our top portion of the wall will be satin paint—Green Tea Leaves/Valspar. Did you cut angles in the corners? Thank you! Yes, we used the same paint on the boards and the wall in between. The goal is to make this all look like true board and batten not sheetrock wall. We did not cut angles in the corners, we just butted the boards together. Hi, Thanks for continuing to respond to comments! I keep seeing people using the existing wall as the board, but my walls have orange peel texture (it’s light, but it’s there). Are your wall smooth? Mine are drywall so once painted they do have a very slight texture from the paint and roller. It doesn’t bother me nor does it look obvious in the space. One it is all painted the same color it blends right in. Did you use any kind of adhesive since you didn’t worry about hitting studs? Can you tell me the paint colors for the blue portion? Beautiful !! That’s exactly what I want for our Master bath. Now I see how easy it can be, Thank you to you AND your husband. Great DIY job. To he honest I am not a fan of DIY bloggers. Here’s why…I am a self employed finish carpenter and I receive many calls from customers asking for board and batten wainscoting. Many homeowners produce pics from Pinterest. But please note to get a true board and batten look you have to remove all the baseboards , shoe molding make sure all of the door and window casings are thick enough to accommodate the 1x material. I could show these photos to a customer and say is this want a quicker cheaper version. They would probably say yes. But the end result quickly grows old! Our battens are made from 3/4 inch MDF cut to length. I didn’t read every post but I read one asking about hitting the studs. 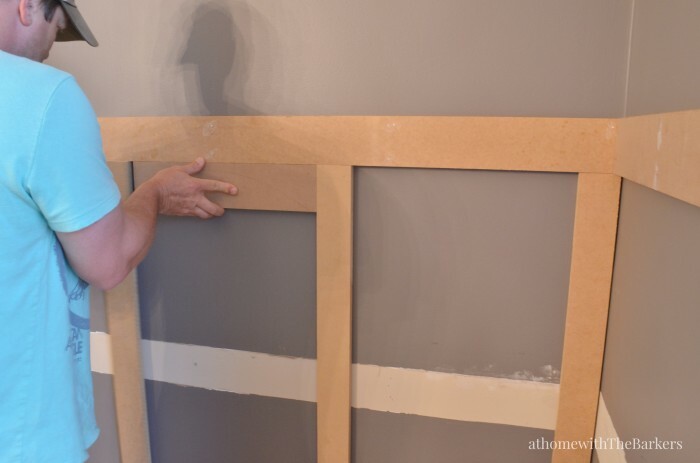 Once you brad nail into the drywall and use caulking on the edges, not to mention the paint, those boards wont need to be nailed into studs. Cheers! 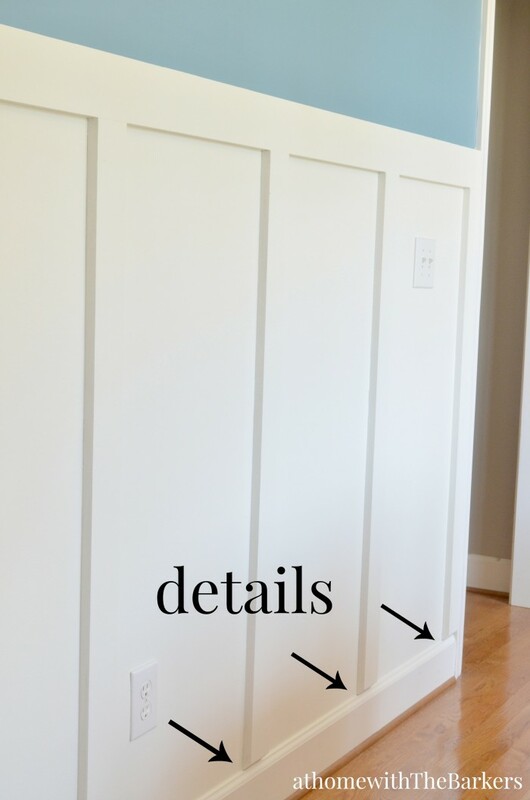 I actually use different size trim and baseboards for all my work. 4.5″ for the base, 2.5 ” for the slats and 3.5 for the top rail. Also if you do use boards like i do make sure to cut both ends square or they will leave a gap due to rounded factory edge on end of boards. Oh yes and very nice work! It needs to look evenly spaced all the way around the room. So yes, carry the width between boards from wall to wall. I would take the walls on each side of that door as one long wall. Take the wall that is most obvious from where you enter the room and make those spaces how you would like. Then you will do the other walls based off that one. If you notice we have a piece of wood on both sides of every corner. Be sure to use the spacer tip to save time. What kind of Brad nailer did you use? Thanks for this super easy tutorial! Getting ready to do this in my hallway, but SUPER nervous about what damage might be behind when pulling off the old chair rail from the 70’s. How did you smooth out the area where you pulled yours off? That is a possibility. Be as careful as you can when removing. We had to add spackling and then sand it smooth. You also may need to sand the entire area that will be painted so it’s consistent. Walls that have been painted will have a roller texture and the place you are sanding will be smooth.